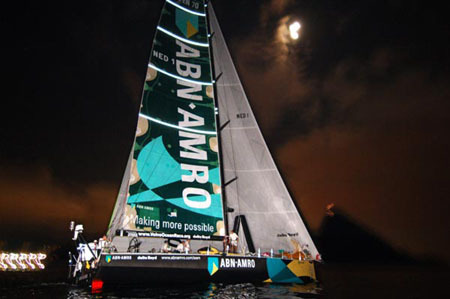 The two ABN AMRO boats went 1-2 in Leg 2 of the Volvo Ocean Race (again), giving them a solid lead in the overall standings. 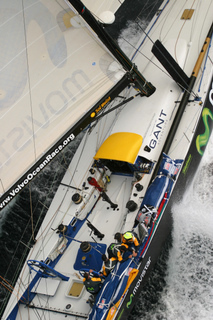 Two boats (Brasil 1 and Ericsson) withdrew with gear failures, and one (ING Real Estate Brunel, now to be renamed Brunel Teamwork), has announced they will skip the next three legs and rejoin the race in Baltimore. With funding for the last-place team being tight, and the opportunity now to optimize the boat for the presumably lighter winds to be found late in the series, the theory is that this will deliver more bang for the boat’s sponsorship buck than continuing to trail the leaders around the world. Canting keel technology is smart technology. It allows you to keep a boat light (which is fast) yet have high stability which translates into horsepower and speed. This technology will be the standard for the entire marine industry, racing and cruising, in 10 years time. Personally, I have a hard time believing that. It’s true that racing systems tend to work their way down to the cruising fleet, but I can’t see how a recreational sailboat industry that is currently losing market share to more user-friendly, if less aesthetically satisfying, nautical pursuits like powerboats and PWCs is going to embrace a complex, expensive, and potentially scary technology like canting keels, at least outside the high-performance racing segment. Photo: That’s ABN AMRO One approaching the Leg 2 finish in Melbourne. Unfortunately, during the second night we faced not so strong wind but really tricky waves, coming right into our faces. Brasil 1 got some really strong hits, changing directions every time a big wave got near. One of these waves was especially hard but in the dark we couldn’t find anything wrong with the boat. 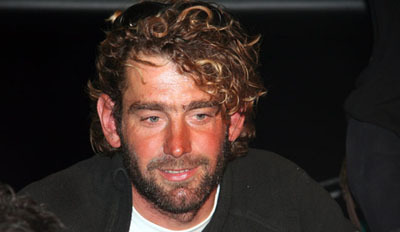 As the sun appeared and the wind slowed down, Kiko found a big depression on the deck with a fissure next to the cabin. We lowered the headsail and reduced the main, to get some pressure off the mast. After a quick evaluation of the size of the problem, knowing that we had 6,000 miles ahead and this was the last chance to come back, we decided to return to land. If we had continued we could put our lives and our boat in danger. I’m devastated. There’s no really another word for it. And even that doesn’t convey the true depth of the frustration and emptiness all of us feel. A major problem with the keel on Ericsson means that for second leg in a row we can’t compete with the other boats in a race to which we devoted months of toil to have a chance of winning. On the first leg, the control mechanism failed with 1,000 miles to go to Cape Town. We limped home for a fourth place finish. Then on Wednesday morning, less than 48 hours out of Cape Town, one of the rams broke with a bang. Down with the sails boys, we’re going back, I told the crew. For about 35 minutes afterwards nobody really said anything. What was there to say? The people at Sailing Scuttlebutt ran a poll, asking, “With two boats broken, should Volvo Ocean Race officials abandon Leg 2 for safety concerns?” The final results: Yes: 54%, No: 45%. Meanwhile, ABN AMRO One continues their winning ways by leading the five boats still on the course. They’ve passed the first of two “ice gates”; special waypoints along the course that require the racers to stay north of the more-dangerous regions to the south, where floating ice is a major concern. 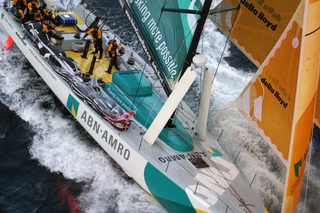 Photo: Unidentified crewmember on ABN AMRO One, from the team’s official site.